don't bite the apple…work is not a fairy tale! | Epic Tales of HR Lore…. It’s time to dance in the kingdom again…. I’m biased this year because the prince’s school may be the Cinderella team this year (Go Bruins). I’m going to be one of the 75,335,520 workers engaged in March Madness activities while on the clock this year. There will be 97 million live streams through the regional finals according to the NCAA and your employees will be watching. Everywhere I visit people are joining in the Madness. How do I know? They are ducking when I pass them, switching screens when HR walks in to talk and hiding the exchange of brackets (they must not know about the Boss Button). I see you…. Relax. As an HR person, I encourage you to embrace the Madness. Have your pools give away lunches, gift cards and prizes. Look for ways to let your employees know that you are aware and as long as the work gets done, it’s ok. Set up a monitor or TV where people can gather or give updates on games. Take in the fun together. The annual Challenger, Gray & Christmas, Inc. survey came out with 2018 statistics and Thirty Seven percent of workers will have the games running in the background. Forty Eight percent of workers will work on their brackets at work. March Madness will cost $13,284,100,580 when 75 million workers spend an average 6.375 hours watching games and researching during the month of the tournament. Make sure your internet connections have a boost and Embrace the Madness. March Madness Productivity in your Kingdom…March Madness, Not Politics in the KingdomEmbrace the Madness…. I originally published this blog post in 2012. As I think about where we are in the world now, I long for the days after 9/11. When we came together after fear. When we were moved by the spirit of heroes. I will never forget that moment. But more important, I won’t forget the unity in the days after the ashes cleared. Today make sure you thank a Soldier, aFirefighter, a Police Officer, and Paramedic for their service. They are the people who will run into the danger for us without hesitation. Nothing shattered the fairy tale more than 9/11. I can still close my eyes like it was yesterday and remember everything about that morning. I spent my Sunday afternoon watching National Geographic’s specials about 9/11 and I was brought back to that horrible day. I watched the interview with President Bush, survivors and people working the scene and I wondered how I would have reacted. What if I was running the country, climbing the stairs with a hose or was an employer in that building? It was a frightening and inspiring thought. Cantor Fitzgerald was a Company that lost 658 of 960 employees. Can you imagine being the CEO of that firm? Would you quit? Howard Lutnick didn’t. He rebuilt and gave back. Cantor has kept its word to the families of those employees lost on 9/11 – distributing millions of dollars of the firm’s profits to them, and covering health care costs for the past 10 years, the Associated Press reports. ‘The best way to show someone you love them is to care for the people they love,’ Mr. Lutnick said. Now every 9/11 Cantor Fitzgerald gives 100% of its revenue of that day to charity. One gentleman they interviewed was saved by a Firefighter that was clearing floors. He saved him and continued to go up towards the impact floor, the Fireman was not heard from again. He mentioned how special you must be to be a Hero. “There are people like me, who want to get out and then there are Heroes. Heroes keep going, knowing they may never come out.” Another man interviewed was blocked by rubble and couldn’t get out. Another group of men screamed at him to climb up and jump over the wall, that they would catch him. He jumped with blind faith and fear. When he made it over, he kissed the guy that caught him. Brian caught him, “I didn’t know what to say so I said, Hi, I’m Brian” They are lifelong friends now. How could they not be? Politics aside, President Bush was amazing. How does one wrap their head around this kind of horror? You can’t ever prepare for this. He was being pulled in a million directions. He stood firm after being dragged to three different places by Secret Service and said “I will deliver my speech from the White House.” He couldn’t imagine a worse image than the president hiding in a bunker, he wouldn’t let the terrorists claim they sent the President running. He was a calming force in a whole new world. How brave he had to be in the weeks after 9/11. How do you know how to lead through that? I remember sitting on my couch, the prince was just a baby, I was watching the crash and saw the second plane hit. I will never forget that moment. At that point we knew it wasn’t an accident. My husband was on his way to downtown Chicago, I was begging him to turn around. They rolled in cement barriers in front of the Sears Tower that night. I remember looking in the sky for the next week and seeing nothing. It was like the world stopped as we knew it. It did and it would never be the same. I wonder if I was on a plane that was taken over, would I sink in my seat or fight. Would I run down the stairs of a burning building or would I check floors and help? If I lost my entire company, would I bow my head and give up or make it bigger, better and give back? I hope that in an emergency, my Hero would kick in. 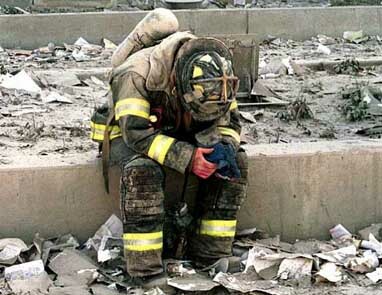 But today I’m just so grateful for all those Heroes that helped on 9/11 and every day since. Today of all days, please thank an everyday Hero. Our Soldiers, Firefighters, Police and Paramedics run towards the danger each day! God Bless Them! **Please click here to donate to the Cantor Fitzgerald Charity 2018!